After the desolate beauty of Morocco’s hinterland, Marrakesh will be a delightful shock to the senses. It’s a whirl of sticky dates and snake charmers, donkey rides and carpet sellers, mint tea, grandiose Islamic architecture and tight labyrinthine streets, not to mention the world-famous Djemaa el-Fna square. You’ll spend one night in Marrakesh in the heart of the Medina quarter where all your needs will be taken care of, whether you want to relax, eat, shop – or do all of the above. First, treat yourself to some world-class pampering at a luxury riad spa. We have a couple of favourites, such as Riad Edward, Riad Rihani, Riad Imilchil and Riad Terra Bahia. 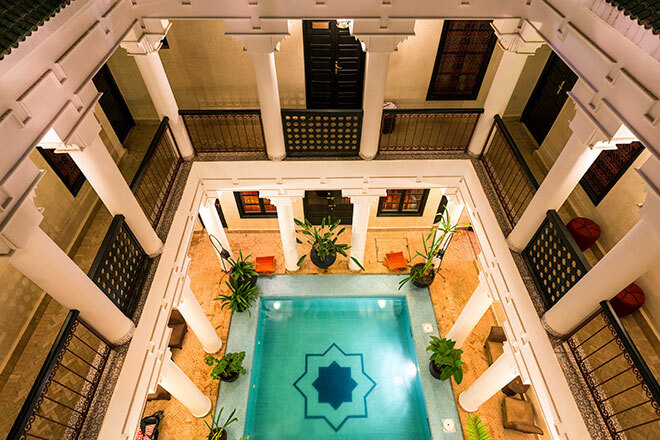 All are located in the Medina and come complete with a gorgeous interior courtyard, traditional Moroccan design, a swimming pool and roof terrace with great views of the Atlas Mountains. In the spa you will have the opportunity to choose between a massage, a scrub down in a traditional hamman or both.